With the immense popularity of bubble milk tea and the quirky modern creation of green tea-flavor Sprite, it’s easy to forget the real meaning of a good cup of tea, even in China where tea leaves have been consumed for roughly three centuries. 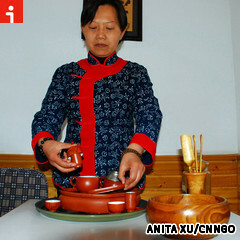 Sun Yuping is the tea master of Shanghai Fenghe Teahouse. 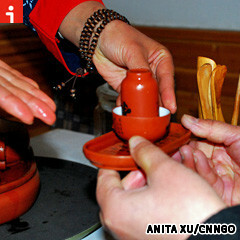 The 53-year-old woman has been practicing the art of tea for more than 12 years, from boiling water to the precise temperature to pouring the beverage with the best angle. We sat down with Sun — over a cup of tea, of course — to chat about tea: when to drink it, how to prepare it, and why you should love it. Spring is high season for green tea lovers. Season matters when it comes to the quality and taste of tea leaves. 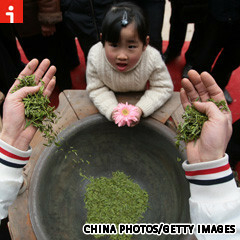 Normally, green tea is collected before the Qingming Festival and the fresh batches are called xincha (new tea). 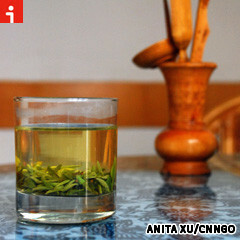 Xincha tastes fresher and more fragrant when enjoyed during that season. 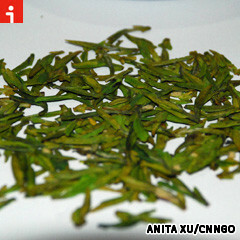 "Xincha is so fresh that it smells just like you’re drinking grass,” says Sun Yuping, "but in a good way." Autumn is the time to harvest some of the best oolong tea. Looking for good Tieguanyin? You’ll probably have to wait a few months for this premium variety of oolong tea. "Generally, the best time for Tieguanyin is the fall,” Sun says. Chinese tea pouring lends a new angle to the question: "Is the glass half full?" So next time when you are served with a cup of not fully filled cha, you should feel extra fulfilled. Many Chinese experts believe that tea should only fill 70 percent of a cup while the other 30 percent is "space for your emotions," says Sun. Leave water boiling too long at your own risk. Not any boiled water will do for tea. Water temperatures between 80 and 90 C are fine for Longjing tea, 75 C is best for Biluochun tea, and aim for 100 C for tieguanyin, notes Sun. According to Sun, customers can refuse the order if the tea is not offered at the right temperature in Shanghai — too low and the taste won’t have developed, too high and the flavor is destroyed. Sun Yuping is a kung fu master … for tea. "Tea lovers ought to have a try of kung fu tea," says Sun. "That’s real art." Kung fu tea isn’t a type of tea or a martial art, but an exact brewing process. Its art lies in a combination of the right amount of tea leaves, high water temperature, particular brewing time and special tea utensils made with purple, sandy clay, which requires time to appreciate. 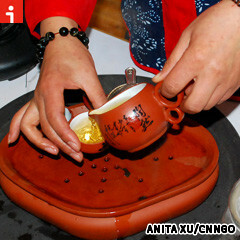 "Although most local tea houses can prepare tea like this," says Sun, "you usually need to ask for it, and you should. The process and taste are worth the effort." 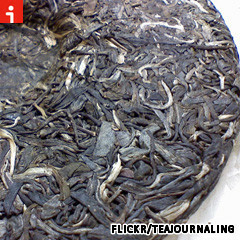 This pu’er tea-leave cake could hide impurities. Usually, you can make pretty good snap judgements about tea just by looking at the buds — all but Pu’er tea that is. Pu’er is a type of post-fermented black tea originated from the city of Pu’er in Yunnan Province. "Excellent pu’er tastes smooth and a bit bitter with a sweet aftertaste,” she adds. Have a cuppa, then we’ll resume the singing marathon. A cuppa with tea with arhat fruit or malva nuts is good for a sore throat, according to traditional Chinese medicine (TCM). "If your profession relies much on your voice, it’s good to have these two at hand," says Sun. Both fruits are unique in Asia — arhat fruit in south China and north Thailand and malva nuts in southeast Asia — and are considered natural medicines by the Chinese. "Specifically, arhat fruit (luo han guo in Mandarin) has noticeable effect on curing a cough," she continues, "while malva nuts (pang da hai in Mandarin) helps to relieve a hoarse voice. 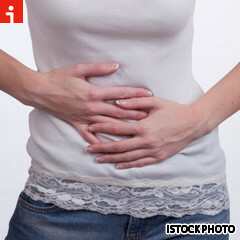 Tummy issue? Grab a glass — or two — of black tea. 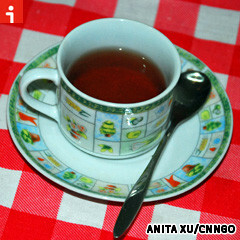 Black tea is a good friend to poor stomachs. During the fermentation process, a large amount of the antioxidant polyphenol is oxidized, and the “oxidation generated in black tea protects the stomach better than just about any tea, including green tea,” says Sun. 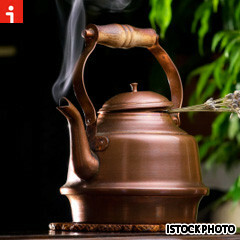 TCM practitioners also believe that black tea promotes blood circulation, thus helping the spirit. Hydration is key for green tea. Although it’s tempting to let your tea run dry, exposing the tea leaves to air after you’ve already started using them actually limits their usage. 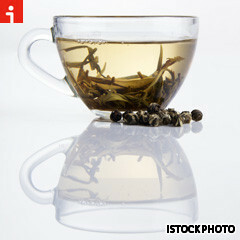 "Oxidization takes place faster when green tea runs dry, forcing tea leaves become yellow and less fresh,” explains Sun. To keep your tea fresh, and be able to use them a few times more times, make sure to continually pour water over the leaves. 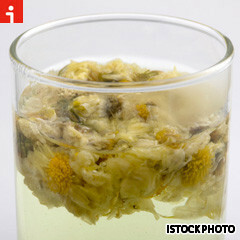 Forget coffee, offices around Shanghai should be stocking Wolfberry chrysanthemum tea. China has no shortage of office workers, and Sun says the best tea for the country’s rising white collar class is Wolfberry chrysanthemum tea. "Wolfberry is beneficial to eyes, while chrysanthemum clears away internal heat, the combination of which helps to reduce office pressure,” says Sun. Keep your oolong tea leaves around a while — they’re late bloomers. It’s easy to use tea leaves once and the move on, but if you’re drinking oolong tea, patience — and possibly a strong bladder — is king. Generally speaking, oolong tea has a heavier flavor which develops over time. Its flavor can survive eight to nine rounds (green tea loses its fragrance within four rounds) of tea drinking, so retaining the leaves is crucial to enjoying the full flavor range. "The more time you use oolong leave, the better they will taste," says Sun. Need more leaves? Don’t be afraid to ask a change up. If you’ve run through your tea leaves and want new ones of the same type, a standard industry practice in Shanghai tea houses is to offer you a free change-up, although they don’t advertise the practice, explains Sun.